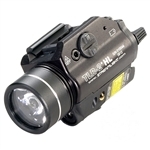 Producing a blinding 750 lumen beam, the ProTac HL can flood a large area with light. It is compact, offers the latest in power LED technology, and has three different user-selectable programs. The combination of its small size and high-lumen output make it one of the brightest tactical personal carry lights for its size.